The new long board is finished. After watching the beginning of the shaping process and sending the photos of that to my brother, he suggested the name El Ray0. Or El Ray-0. That was based on a few back and forths about the progress, the shaper (Ray), Dave Lindley's back up band, El Ray-O and the familial tendency to number everything (My brother being 2.0 vice junior.). That same brother could, no doubt, give you 1800 words on the naming process alone. Cutting, somewhat, to the chase, there is no doubt on the El or the Ray. After that there is a zero. Then there is maybe a hyphen or a dot or nothing between the Ray and the zero. That really is the short version. It was certainly strong attraction at first sight. The finish is brilliant. Loved the shade of blue he picked. The green pinstripe around the edge was an excellent complement to the gold paint on top the stringer. I even liked the subtle promo logo he put on the front. I was thinking of asking to add a graphic G on top the stringer, but that didn't feel right. Nor did the idea to put a bulls eye or the "center-line" symbol that goes on construction drawings. In the end, my thought was "don't junk it up". I'm liking that idea now. He pointed out the main fin he selected. Dead on perfect for a nose rider. Long but very little rake. From what I've read and seen on the videos, this is the state of the art fin for the type of riding I was looking to do. Ray was on his way to a wedding in Santa Barbara. it was his best friend, who I have to presume is a surfer, on account of Ray was wearing...well, not exactly a black tie. It was a black polo shirt. he commented "As you can tell, this isn't all that formal. It's in the Mural Room at the city hall. Nice room, I rewired that when I worked for AT&T." Oh right, i managed to forget that we were at one time coworkers at that company. He asked if I was going to take the board out. I nodded. 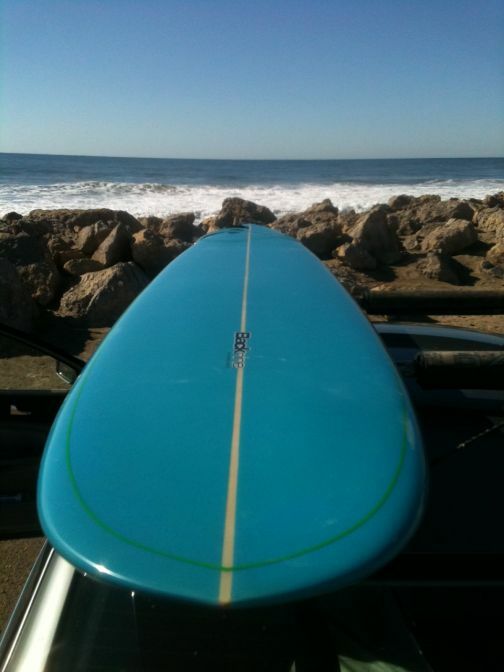 "There is a little surf out there today, wind blown..."
Little is why I got this board. Something to surf on days when the surf is down. And even on down days, Point Mugu usually has something going as that is the most aggressive beach in the area. I drove over to Mugu. There was a lot of action in front of me. Also, there was not one surfer in the water. In general when no one is surfing mugu and the seas are churning, there is a good reason. That reason being, it is unsurfable. I got my board waxed up and over the rocks without incident. Plunged into the water and was tumbled around like I was in a dryer. Two or three good tumbles and was driven 200 yards south by a brutal tidal current. Ok, ok. I got the message. I've had a number of days here were I go out, get pounded and turn around and head to another beach. This wasn't one of those days. I walked up the beach 400 yards. Moved from the place where it was totally impossible, to a place where it was virtually impossible. That was good enough for me. First ride and in a matter of seconds I knew this was the most stable board I'd ever ridden. Granted it was also the longest. But still, it was rock solid. One the second ride I tried to make a couple turns. It was more responsive than my 8' 6" board. Whoa! I added 15 inches of stability and found a board that turns better? After ride two, the "strong attraction at first sight" progressed to "long term relationship at second ride." Still, as with all budding relationships, it was not without it's issues. Since this is a nose rider design, there is very little rocker up front, making it susceptible to pearling (driving the nose into the sand, i.e. pearl diving) when I take off. So I had to adjust the take off in some cases and totally abort it in other cases to avoid a total wreck. Also, there was the "protection" issue. Even though it was not quite cold enough to wear a hood, I tossed on my noggin condom before hopping in the water. That was my best move of the day as the main fin made a valiant effort to shear off my right ear on one really bad trip through the tumble dryer. Ended up staying in the water for a good 90 minutes. Given the pounding, not much of that time was spent surfing. But every ride validated what an exceptional job Ray did in shaping this board. I eventually said no mas to the surf and lugged my board back to the car. By now two guys in a pick up showed up to scope the surf. There was a lot of pointing and head shaking before they finally turned to me and asked "A lot of current out there, huh?" I guessed 8-10 knots on the tidal currents, certainly as bad as I've ever felt it there. I checked my watch and realized that I still had time. I hustled out of the wet suit and secured the board to the roof of my car. It looked like it would be close, but I thought if I floored I just make make it to Santa Barbara. Given that this is California and the local magistrates will wed anyone to about anything...I just needed to figure out how to squeak an "I do" out of El Ray0 and we could make it a double ring ceremony.